There are three Cromarty churches in which weddings can be conducted: Cromarty Parish Church of Scotland (the 'West' Church), St Regulus Church (Scottish Episcopal) and the newly-restored East Church. See map for church locations. You do not need to be a member of a church to get married in the church. The parish minister is willing to discuss conducting marriage for any member of the parish. If you are not a church member, the minister will want to discuss with you whether a religious ceremony is what you are looking for, whether it will have meaning for you and whether it is appropriate in your situation. 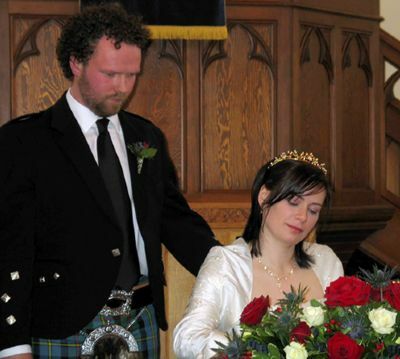 Ministers of the Church of Scotland can also conduct blessing ceremonies for civil marriages (those which were legally conducted by a registrar and not in a church). Click here to read the marriage liturgy of the Scottish Episcopal Church. Restoration work on the historic EAST CHURCH was completed in April 2011. It is now available as a venue for occasional religious services (including weddings), subject to approval by the Scottish Redundant Churches Trust and the local parish minister/Kirk Session. The East Church is suitable for weddings between May and September. There is no heating and it may be quite chilly at other times. If you are interested in a wedding in the East Church, further information is available on the East Church website.